In a competitive global SCADA market for water and wastewater treatment, well-entrenched players are focused on expanding their product portfolio and global outreach to serve a large customer base. Majorly fuelling the global SCADA market for water and wastewater management is the increasing investment in infrastructure for water and wastewater. Further, increasing complexities in maintenance and management of water and wastewater facilities are also boosting the demand for SCADA systems. The advantages of increased efficiency in wastewater management is also driving the adoption of SCADA system. This attribute is leveraged by several governments that have undertaken initiatives for technology-based processes for wastewater management and have formulated regulatory framework for monitoring and controlling water and wastewater services. On the downside, design complexities and high installation cost are limiting the adoption of SCADA systems. The global SCADA market for water and wastewater treatment is poised to expand at a CAGR of 5.6% between 2015 and 2025 for the market to become worth US$2,172.1 mn by 2025-end from US$1,267.4 mn in 2015. The global SCADA market for water and wastewater management is segregated into hardware, software, and services as per component classification. According to the report, the market is likely to witness the dominance of services in the coming years. The services segment occupied more than 55% market share in the overall market in 2016. This is mainly because of rising demand for SCADA system for a host of applications, among which installation services, consulting services, and maintenance and support services are prominent ones. During the tenure of the forecast period, the services segment is prognosticated to display an impressive growth. This is because emerging economies in Asia Pacific are increasingly employing SCADA system for real time data monitoring across industries. The increasing acceptance of process automation across a host of industry verticals is also triggering the growth of services component of the market. Within the hardware segment, programmable logic controller (PLC) is expected to create handsome opportunities for SCADA market for water and wastewater management over the forecast period. As per end user, the global SCADA market for water and wastewater management is classified into residential and industrial. The segment of residential is further sub-segmented into government and private. The segment of industrial is further sub-segmented into chemical, food and beverages, pharmaceutical, and others. According to the report, the industrial segment is expected to witness healthy growth at a CAGR of almost 6% during the forecast period between 2015 and 2025. This is mainly because of growing adoption of SCADA systems across several industries such as chemical, food and beverages among others. In terms of geography, the report takes stock of the potential of global SCADA market for water and wastewater management in the regions of North America, Europe, Asia Pacific, Latin America, and the Middle East and Africa. In 2016, North America emerged as the most lucrative market serving a demand that attracted a revenue of 33% in the overall market. Going ahead, the rising popularity of cloud-based SCADA for water and wastewater management will account for the strong growth of this regional market. Europe is predicted to be a significant market rising with an approximate CAGR of 5% between 2015 and 2025. Stringent regulations for the treatment of wastewater and demand for employing efficient processes for the same are responsible for the growth of this regional market. Asia Pacific is expected to display strong growth in the SCADA market for water and wastewater management in the upcoming years. Leading players in the global SCADA market for water and wastewater management include ABB Ltd., Schneider Electric, Emerson Electric Co., Tesco Controls Inc., SCADAware, Yokogawa Electric Corporation, Rockwell Automation Inc., Eaton Corporation, Honeywell International Inc., and Parasyn. This report provides an analysis of the global SCADA market for water & wastewater management for the period of 2015 to 2025, wherein the period from 2017 to 2025 comprises the forecast period and 2016 is the base year. Data for 2015 is provided as historical information. 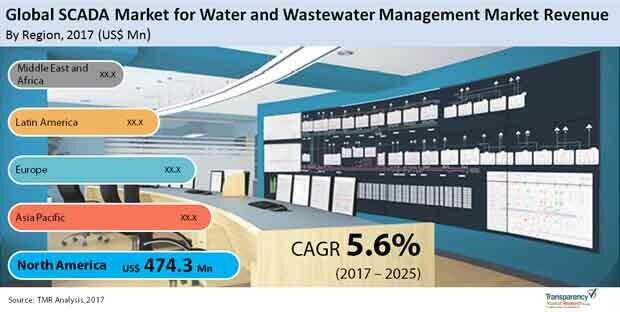 The report covers all the major trends and technologies playing a major role in the growth of the SCADA market for water & wastewater management over the forecast period. It also highlights various drivers, restraints and opportunities expected to influence the market’s growth during the said period. The study provides a holistic perspective on the market’s growth in terms of revenue in US$ Mn, across different geographical regions namely North America, Europe, Asia Pacific, Middle East & Africa and Latin America.